Biscuits--yes, plain old-fashioned biscuits--are one of those things that can make your reputation as a cook. Even if you really can't cook a lick, if you can make a certain few things, everyone thinks you're a good cook. What are these few things that if mastered make it possible for you to fake it as a cook for the rest of your life? Pie, some kind of yeast bread and biscuits. Of the three, the easiest is biscuits, so let's start there. If you've only ever eaten the kind that come in a tube that you whack on the edge of the counter to unravel, a homemade biscuit will be a revelation. And once you see how easily and quickly they can be made from scratch and how much better they taste, you will never again resort to a mix or a frozen or canned biscuit. My basic recipe has many variations. Sometimes I use milk, sometimes buttermilk, sometimes a combination of milk and buttermilk or milk and sour cream or milk and plain yogurt. It's very flexible. 1 Preheat oven to 500F/260C/Gas10. Lightly spray an insulated baking sheet with cooking spray. If you have a food processor and want to use it for this, with metal blade in place, combine the flour, baking powder and salt in work bowl of food processor. Pulse 3 times to combine. Add frozen butter and process for 8 to 10 seconds or until mixture resembles coarse meal. Transfer mixture to mixing bowl. In 1-cup glass measure, combine buttermilk (or sour cream or plain yogurt) and milk; pour over flour mixture and gently mix until just combined. 2 If you don't have or want to use a food processor, whisk together the dry ingredients in a large bowl. With your fingers or a pastry blender or two knives, cut in the cold butter until the mixture looks like coarse crumbs with some bigger chunks remaining. In 1-cup glass measure, combine buttermilk (or sour cream or plain yogurt) and milk; pour over flour mixture and gently mix until just combined. 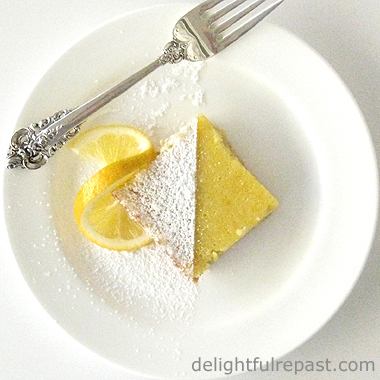 3 On a lightly floured surface, gently pat the dough into about a 3/4-inch-thick 6x8-inch rectangle. Cut into 12 square biscuits, and then gently round each biscuit by hand (as in photo above) or leave square. (If you use a round biscuit cutter, you either waste dough or have some tough biscuits made from re-rolled dough.) Place about 2 inches apart on the insulated baking sheet and bake for 10 minutes or until golden brown. Note: Biscuits may be frozen, double-wrapped, for up to one month. Thaw at room temperature, wrapped, then unwrap and heat at 350F/180C/Gas4 for 5 minutes or so. Keep some on hand for biscuits and gravy! Thank you, Jan Fredrik, for those production figures. I had no idea China was a great producer of apples! One of my favorite apples is one that is popular in England, Cox's Orange Pippin. Don't have it here, but I have a good taste memory. I always buy the apples (or anything else) that are grown closest to home. 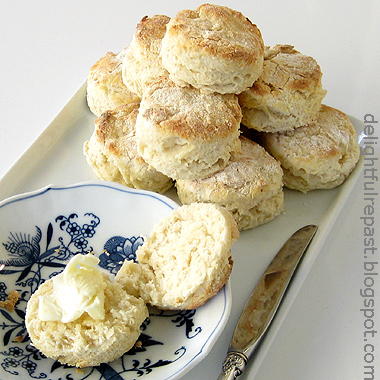 I have to say, biscuits (or as we call them here in Australia, scones, though our variety usually have less butter in the mix) are one of my favourites to both cook and eat. Here we have them with jam and cream, though occasionally with savoury items. What I really enjoy though is when they are a day old, cutting them in half, toasting them and having them with butter and home made jam. Yum! Great advice about not using a round cutter. You are right, there's always a couple of tough ones left over from the re-rolling. As always Jean, thanks for a great blog post. Thanks, Grant. I make scones, too. I think I posted them last month. They have even more butter than my biscuits! Alright Jean, I'm gonna make biscuits this weekend. Wish me luck! Yum, biscuits are really my favorite food! I tried making my own from scratch in college, using the recipe from the Joy of Cooking book. They didn't look very lovely, and I was even teased about them by my roommates, but they were so delicious, they were gone in a flash! They might be mine, too. 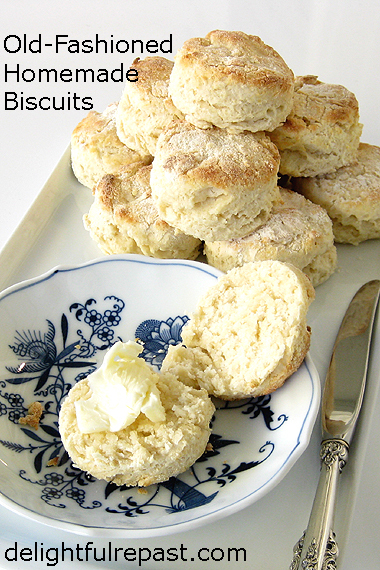 I think I could live on biscuits, with scones for dessert! I was just talking to someone at my daughter's ballgame tonight who had been visiting my blog. She said she was going to try some of the easier recipes, but not the harder ones "like homemade biscuits". Oh how I wish people would have the confidence to just try them... they'd be so surprised at how easy they really are! I don't often find myself with many leftover biscuits, but even one or two are worth popping into the freezer for a rainy day!